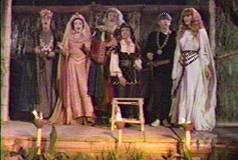 My introduction to both Hamlet and the opera, Carmen, was through a Gilligan’s Island episode--you know, the one where a movie producer crash lands his plane on the island with them. He sends out a distress call, so it looks like at last help is on the way--hurrah! But, before the rescue, Ginger wants to convince the producer to cast her in one of his movies. So our intrepid castaways come up with the brilliant (at least brilliant to all future pop culture) idea to stage Hamlet set to tunes from Carmen. (And also, it turns out, from Offenbach’s Tales of Hoffmann, but I just learned that.) The producer is impressed, so impressed that he slinks away to be rescued without them so he can produce Hamlet, The Musical as his own original idea. Poor islanders, foiled again. Gilligan’s Island ran from 1964 to 1967. This astonishes me because it means that during the 70’s, when I saw it, I only ever viewed it in reruns. (In between Bewitched and I Love Lucy episodes. Oh that Desi.) And, boy, did I view it. Gilligan’s Island was a staple of my childhood. I must have seen every episode at least three times, especially during the long rainy Seattle summer afternoons when only reruns filled the airwaves. Television had enormous power and influence on me during those years. To say it was my window on the world is a vast understatement. What an astonishing use of my time and childhood. I grew up in a classic, brand new subdivision rife with young families and children where every house was decorated in Harvest Gold or Avocado Green. Your choice of color would determine the shade of your shag carpet, appliances and panel of hideous frosted glass located next to your front door. 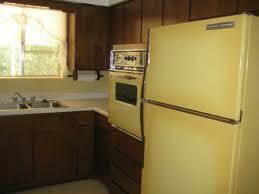 I’m sorry to remind you that this is how many of us lived in the 70’s, I truly am. I just spent five minutes looking at photos of ugly 70’s kitchens, and it is more depressing than I can say. 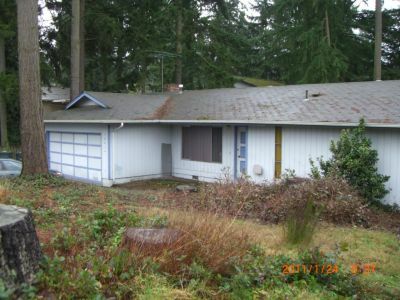 In this classic, hastily-built subdivision there were three choices of floor plan—rambler, tri-level or split level. Every friend’s home you went into you knew where to find the bathroom because you’d already been in three other houses exactly (and I mean exactly) like it. Even as a child I knew this was wrong, that I was living in an architectural wasteland. My subdivision was named “Wellington.” I assume this was after the Duke of Wellington, defeater of Napoleon, victor of Waterloo. I could weep. My house was of the rambler variety. Three bedrooms, two baths. It looked something like the photo to the right, except it was brownish-olive-brown in color. Brown was very seventies. People wore brown, decorated with brown, and had lots and lots of brown hair. Men had brown moustaches and sported brown sideburns. People began to eat brown bread and macramé brown hanging plant holders with brown jute that would hold brown plants once the poor things died. 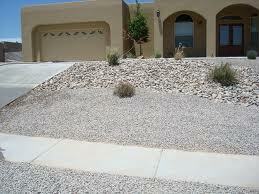 My father didn’t want to mow grass (he had allergies), so he covered our front yard in rocks. It looked a little like the photo to the left, except, well, less attractive. But I do admire his willingness to experiment. Every other yard in the entire 80-house subdivision had a freaking lawn. We were the strange ones. Though I didn’t read Hamlet until my freshman year of college, it must’ve been sometime during the purgatory just this side of hell known as junior high that it dawned on me that the play in the Gilligan’s Island episode was a highly abridged version of one of the greatest works in the English language. The source of most of the episode’s tunes probably didn’t occur to me until I studied opera during my junior year abroad and saw Carmen for the first time in Florence. Now, though I love Carmen, I’m not a huge fan of Hamlet; he’s too petty and indecisive for me. (He was the son of the king, for crying out loud. His rightful throne was usurped. Why the heck didn’t he get some nobles together and chase his uncle out of Denmark?) Twelfth Night, Merchant of Venice and The Tempest are my favorites of Shakespeare’s plays, and I’ve got a soft spot for Romeo and Juliet. But Gilligan will forever whisper in my ear (to the melody of the Habenera aria), “To fight or flee, to fight or flee. I ask myself to be or not to be?" So two of the heavyweights of the Western canon were introduced to me by the likes of Lovey and Thurston Howell the Third. Faux, ersatz, a parody before I had any idea of what was being parodied. Did my culture value me so little or the works so little that I was fed the spoof rather than the real thing? I guess it could’ve been worse. No doubt children these days miss nary a classic via The Simpsons. But Chopin—Chopin was different. He didn’t come through the back door. 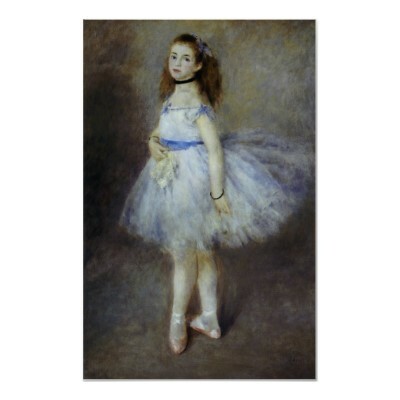 He was introduced to me as he ought to have been--whole, genuine, the real thing--straight into my soul via the ephemeral elegance of ballet. Trapped in my seventies subdivision, attending a school that mostly bored me to tears, my one saving grace, besides reading a book a day, was ballet lessons. I took ballet at first twice a week, then three times, then pretty much most of Saturday added as well. And Chopin was the music of the barre, of the center floor, of the porte de bras. Yes, his tempo was often altered slightly so my teacher, Mrs. Bruce, could sternly count, “And one, and two, and three, and four,” but it was still him directly responsible for the rippling notes. Eventually I gave up on ballet after glimpsing that this rarefied, mysterious world wonderfully far from shag rugs and television laugh tracks might also be accessible through literature and college. 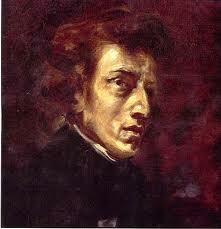 Chopin’s music still beckoned, so enigmatic and sublime. Life would be a glorious wonder if only entry into his universe could be obtained. There are cruelties and there are cruelties. Ballet is merciless. It knows its enchantment and demands everything of you that can be given. It is so heartless it can turn away emaciated orphans from its door without a twinge of regret. 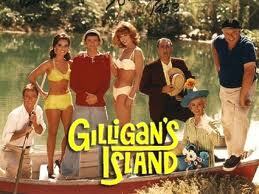 Gilligan’s Island in comparison was a TV dinner cook. Its intentions were no doubt benign enough, but when I was literally starved for culture, it fed me Twinkies and Cheez-Whiz. 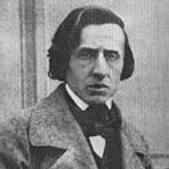 But Chopin, it turns out, was the cruelest of all. Yes, he fed my soul when I had little else to sustain me, and yes, I still hear traces of that magic world (secret garden?) as I play his notes on my piano. But there is never a final passageway to enter, no key to turn in the last lock. Yes, the floating preludes, the hushed nocturnes, the soaring waltzes limn the mysteries of the human experience. They allude (so delicately!) to the vast, lost chambers in our souls we long for but never visit because we’ve forgotten how or never knew the path. But his music promises what might be, not what is. And it’s not a promise that it keeps. Did he promise a rose garden? Perhaps this isn’t Chopin’s fault. Perhaps he just glimpsed these worlds, too, and the best he could do was communicate potential, not define how to achieve it. Perhaps, indeed, sensing a plane of consciousness askew to our own, one just out of reach, that we catch sight of only from the corner of our eye or in a fleeting run of notes, is an immutable part of being human (transcended by a few lamas and saints.) We get the moments, the glimpses, and must bear it best we can. Even if it means we live out a Gilligan’s Island version of Hamlet. Really lovely post, I grew up in the 70's too and watched Gilligan's Island obsessively too, although I have to admit towards the end, even though I already knew the outcome, I found myself wishing The Skipper would just tie him up or just knock him out, just temporarily of course, and the send back a search party to rescue him. Besides me being Puerto Rican(which means that I was exposed too many different types of musi, my Dad's fav. Was the opera but all latin music was played at home) I also took ballet, just for a year but I love it to this day and feel that just that little year influenced me greatly, all dancers should have some ballet. I found your blog when I searched for the opera episode of Gilligan's Island, a show I watched in real time, making me a few years old than you. To this day, I can't hear Carmen's Toreador without singing along with the skipper's words. but I never quite get it down the way it plays in my head. Just wanted to drop a comment so you know someone is actually reading you! Thanks for the comment! We are probably of the same age. It's funny how the nooks and crannies of one's culture seep permanently into the recesses of our minds. Whoever wrote that Gilligan's Island episode is probably still chortling at the bizarre permanent neural synapse connections he/she caused. Your blog is good! Who knows what, in the end, the purpose of something as ephemeral as a blog (living only among the bytes and pixels) might be, but capturing a moment, either of time or of understanding, is never a bad thing. Harold Hecuba was truly evil.